Would you like to bring the serenity and tranquility of nature to your backyard? A backyard laguna pool may be exactly what you need! Not only has Dorian Construction Group has been installing laguna pools in El Paso for over 25 years, we are also the only group in the city that offers this service. 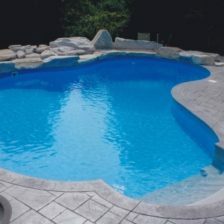 Since we are experts at delivering style and quality, your laguna pool will look as beautiful as possible. Whenever we take on a project, we make your hopes and vision the most important aspect. You’ll get exactly what you want, all with the best workmanship. We won’t only meet your expectations, we’ll surpass them. So, before we get started, here are some of the benefits that come from choosing laguna pools. 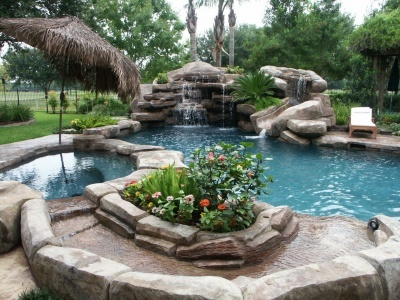 Laguna pools perfectly combine nature with craftsmanship. 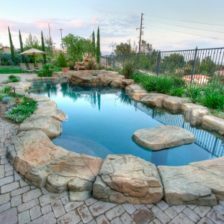 By bringing together beautiful rock faces, waterfalls and also plant life with natural pool designs, laguna pools will turn your backyard into a paradise getaway. Laguna pools also offer a completely original pool-going experience. These types of pools are meant to combine nature with practicality. For this reason, you’ll see that beauty of the pool, with rocks, plant life and waterfalls, is reminiscent of a paradise pool. But the true beauty manifests when you take a dip inside the pool. It works as a perfectly functional for swimming and leisure, all while looking as natural as possible. Laguna pools offer a truly unique pool-going experience and you can make this a reality in your backyard. 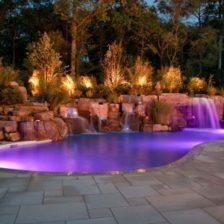 So, whether you’re entertaining guests or just want to take a dip after work, laguna pools offer originality and style. 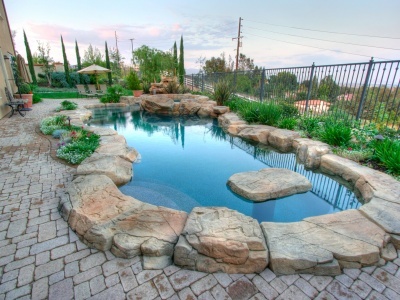 Unlike common pools, laguna pools go beyond the ground level. 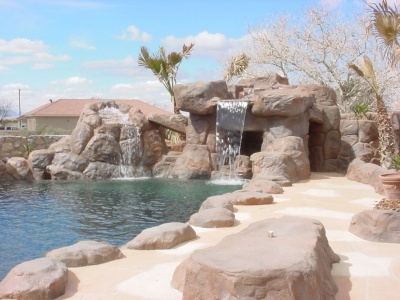 With replica rock formations that can include hidden slides, natural-looking waterfalls, and even bridges, your laguna pool will offer more fun and beauty than any common pool ever could. The options for laguna pools are virtually endless. You can decide on all the details that will go into your new backyard getaway so the result will truly be an original masterpiece. Want a beach-like entrance instead of steps? Or better yet, want a rock tunnel that turns into a slide? 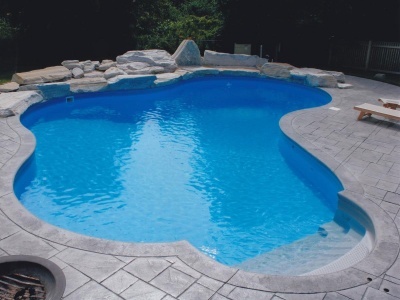 All that and more is possible with a laguna pool from Dorian Construction! 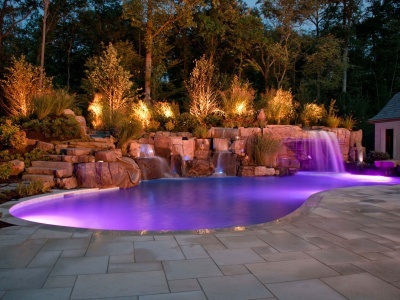 So, would you like a laguna pool installed in your backyard? You are in luck! 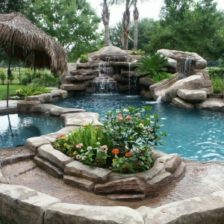 Since Dorian Construction Group is the only group in El Paso that offers laguna pool installation, we’ve got you covered. If your backyard is ready to be taken to the next level, contact us. Together, we can design and build your dream getaway laguna pool and you’ll be amazed by the results. When it comes to laguna pools, Dorian Construction Group are the experts. 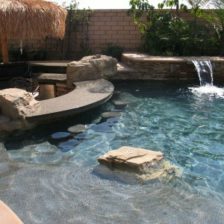 We are the only team that offers this service so come to us and bring the serenity of laguna pools to your El Paso home. It’s time to call Dorian Construction for a free estimate! Contact us today.